My eyes swept around the packed bus of college students to make sure no one would notice the book that I wanted to pull out of my backpack. As usual, everyone was engrossed in their phones, ear-buds in, oblivious to the rest of the world. Certain that I wouldn't be bothered, I settling into the 20 minute ride to the nearby campus and furtively took out an English translation of the Chumash. I didn't want to have to explain to anyone why I was reading “the Bible”. Every baal/baalat teshuvah looks back at his life searching for the pivotal moment that led to his return. When my “return” began in my sophomore year of college I was deep into meditation, mantras and ecstatic poetry, but the night my grandfather died, I realized that I had to find something more. Around that time I began to have vivid dreams. Dreams rich with color and emotions would fill my nights, and every day the details would come flooding into my consciousness. One night, I dreamt that someone in my family died. When my alarm started beeping to wake me up, I turned it off, rolled over and fell back into a deep, dark sleep. The next day I was late for class and was walking around in a daze. I left my lecture early, when I saw my dad calling me. He told me that my grandfather had passed away the night before. While I sat under the trees at the lake crying for my loss, I also felt my sense of reality expanding. I was raised believing that everything had to be logically or scientifically proven for it to be real. After that dream I started thinking that there was something going on in this world beyond what I could see and what logic could prove. I was also struck by existential questions that kept turning over and over in my mind: Where does the you go when you die? What is the point of my life? How do I know what is true? My classes were certainly not providing any answers to these questions. Little did I know, when I applied to my college, that it was full of Jews: modern Orthodox, unaffiliated, and everything in between. One day, as I walked down the hallway of my dorm, a friend called out, “Hey, aren't you Jewish? Want to come to the Hillel ‘Welcome Barbeque’ with me?” Startled, I declined, saying, “Yeah, I'm Jewish, but I never even went to Hebrew school!” My friend persisted. Eventually, I gave in, but I was really nervous walking up to the Hillel building. What if they ask me to name three Jewish Holidays, or say something in Hebrew? Under my breath, I tried to recite the only Hebrew words I knew — the blessing for Chanukah candles — but, I had to mumble over the ending. Once I was inside, I found myself eating a hotdog and chatting with a friendly upperclassman about Israel. It turned out that all I needed to say was that my mom was Jewish and I was in! After I learned about a free ten-day trip to Israel, I decided to accept my Jewish identity just enough to go on the trip. In a twist of fate, two months after my grandfather passed away, I was on a plane to Israel, the land of my people, at the beginning of a journey of which I was totally unaware. I didn't go to Israel to search for the answers to my questions. I didn't think my accidental visit to the Hillel was connected to my existential search. I also thought that the Torah would be the last place to find a spiritual path, a “book” that I was raised to believe gave fuel to most of humanities conflicts. What really won me over to Torah Judaism wasn't the answers to my existential questions. Of course, there are beautiful, life-changing values expressed in the Torah providing the meaning of life, the soul, and even reincarnation. But, what I really fell in love with is Jews. On my first visit to Tzfat we stopped into an art gallery run by a mystical hippie who looked straight at me and said, “Dude, Torah is aaawesome!” After that, all my misconceptions about not being able to “be myself” and be religious went out the window. A few months of learning, reading and questioning went by and I was satisfied. There is something real here and I want it. So began my college double life. During the week I lugged my backpack around campus, met with professors, and tried not to look or sound “too religious.” When Friday afternoon would arrive, I would don my Shabbos best, hop into my beat-up Subaru and head off to the alternative universe of Orthodox Jews. Saturday night would always be a jolt to my system; changing sacred to secular, families to rowdy college kids, peace and quiet to pounding music. Let’s face it, liquor is here to stay. It made it through prohibition, albeit bootlegged. Liquor finds its way into all of our simchas. And yet, there is a concentrated effort in Jewish circles today to limit hard liquor. A sweet liqueur is no more powerful than the wine for Kiddush, but real liquor is being recognized as a dangerous substance, especially because of its effect on young people. Alcoholism has long been viewed as a serious and dangerous addiction, controlling its captive addicts both physically and socially. Over time, it is unquestionably a killer. But even the daily bouts with alcohol lead to social estrangement. Driving while intoxicated (DWI) is a crime of the highest order, one that is responsible for many deaths each year. When reaction time is measured in the milliseconds, a slightly slower reaction time can spell the difference between living and dieing. Many synagogues are reacting to the negative effects of drinking by outlawing “kiddush clubs” in their shul. A “kiddush club” makes a weekly kiddush with more than ample liquor served. One kiddush club, concerned by the “new regulations” found a place outside of the shul to house their weekly kiddush. Indeed, some members in such shuls feel challenged either because they think of themselves viewed by others as “wicked” or because they “just like the stuff” and don’t want to be forced to give it up. But, if they were to view the ban on liquor as a way of protecting the youth from the negative effects of intoxication, even they should applaud the shul’s new policy. May we humbly suggest, however, that, to avoid a backlash to a shul ban on liquor, a broad base of support should be in place before putting such a ban into effect. Friday night drinking was totally unheard of until recently. Liquor was limited to that little “shnapps glessel” which you drank between the fish and the meat. Wine was for kiddush, and that was it. Come again next week. The few who had a taste for wine, used to control themselves; their drinking being limited to a few more ounces. Unfortunately, in fine communities, some young people parade in the streets around Friday night high from beverages that they got at home at the Shabbos table. Perhaps, the wide variety of alcoholic beverages available these days has resulted in Friday night tables being filled with alcoholic “choices.’ The boys are merely sampling them. Parents should be on guard. The wife of a religious man in my community confided in us how much she dreaded Purim. Seeing her husband seriously inebriated, behaving in a strange manner that did not reflect the man she had married, made her hopeful that he would find an alternative way to show simcha on Purim. What is the reaction of this man’s children when they see their father in such a state? The old style was, I believe, at least in the homes of rabbonim, that all excessive drinking was limited to the seudah and remained private. I personally, never saw my rebbeim drunk on Purim — high, yes; drunk, no. They were very spirited, but always in control of themselves. Every year, Hatzolah warns parents before Purim to curb their son’s drinking. And still, year after year, Hatzolah members are called upon to respond to calls about boys with “zero” pulse who are quickly transported to the hospital. Maybe it is time to “lick liquor” and to create a Kiddush Hashem. KASHRUS will continue to list the alcoholic beverages that are newly kosher-certified or no longer so, but we will try to attach a warning to highlight the negative effects of abusing alcoholic beverages. 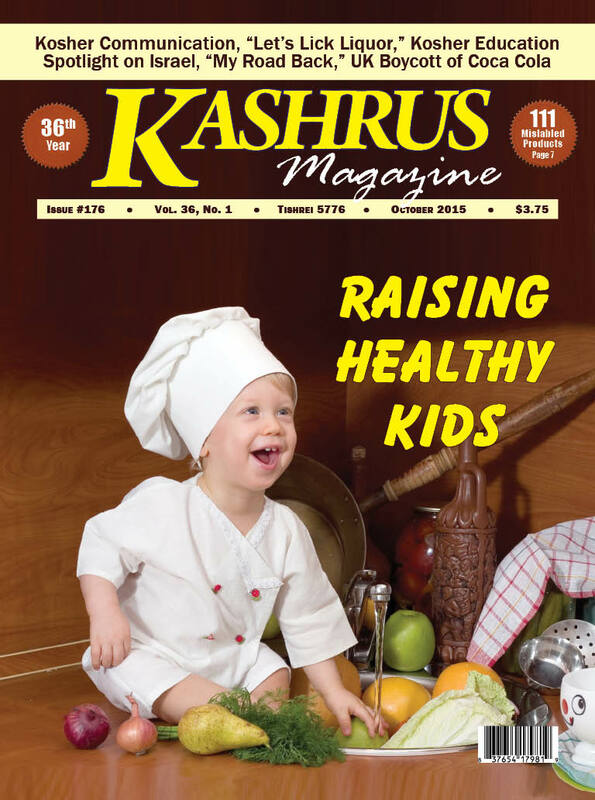 Is raising kosher healthy kids any harder than raising healthy kids in the non-kosher world? Absolutely not! As a matter of fact, most ethnic groups are facing increasing obesity rates. Childhood obesity, a serious illness, is defined as having far too much body fat. It's much more than your clothing size or how you look or looking zaftig. It can seriously affect your health. Obesity rates in children ages 2-5 in the United States have risen from 5% to 17% in a 15 year period. Does being kosher play a role? Yes, however it is really being religious, not being kosher that makes a difference. A study on the predominantly Orthodox Jewish community in Chicago found a staggering 26% of children obese. This is similar to rates in Puerto Rico, Mexico and other low-income populations. Alarming? Yes, since religious activity is generally associated with good physical and mental health. Obesity is not just physical. Complications that begin in childhood include liver dysfunction, high blood pressure, diabetes, sleep apnea, heart disease, bone fracture, and even infertility. Childhood obesity in the Orthodox population might be attributed to several factors. Some interesting theories follow. 1. Religious people smoke less, so they eat more. 2. They have more social gatherings centered around food. 3. Focusing on weight is not a priority to them. 4. Marriage has been associated with obesity and religious people tend to marry younger. 5. Religious people do less exercise and less studying about nutrition and health. In general, religious people are more accepting and, therefore, do not stigmatize or burden themselves with current health knowledge, which, due to the multiplicity of opinions and findings, can be quite confusing and time-consuming. The two main contributors to childhood obesity are low activity level and diets based on meat, dairy products and high-calorie, low-nutrient foods. The good news is that obesity is preventable. Parents need to take the lead by being an example. Convenience foods, like packaged snacks and fruit juices, are costly to your health. If you want to raise healthy kosher children, you need to take the lead. 1. Don’t drink your calories, even if it is 100% fruit juice that you are drinking. Getting calories from beverages is like buying an expensive pair of dress shoes when you could have spent that same money on a pair of walking shoes, dress shoes and sandals. Your calorie limit is like a budget, treat it that way. When children fill up on drinks, they aren’t hungry for nutritious food. Put down the colored drinks, juice boxes and any drink with the word sunny. Make your own fruity drink.Here is an example of a delicious refreshing drink without calories. 1. Add cranberries to a pitcher and gently smash to release some of the juices. Add orange slices. 2. Pour water on top of fruit. Stir fruit to mix. 3. Serve immediately or chill, covered, in the refrigerator. Enjoy! 2. Focus on healthy snacks. Smart snacking is the key to success. In the world of convenience foods, it is easy to send your child out with a bag of chips. Snacks are not meals or a time to eat junk. Snacks are meant to carry over your child until the next meal. There is no substitute for fresh fruit. They are cheap and colorful. Children love to dip and the best way to get your child to try new fruits and vegetables (this is based on many long term studies) is to get them to dip. A snack of green beans dipped in a raspberry vinaigrette is just as easy to prepare as opening a bag of cookies. Get them to try different fruits and vegetables by putting out hummus or a fruit vinaigrette. Cut them in different shapes and ask them to help you prepare them. Snacking on cucumbers will be fun for a child if they think they helped you prepare them. Encourage your child to try new fruits and vegetables by having them talk about colors, shapes and sizes. 3. Choose a plant-based eating style. It is a simple way to achieve and keep a healthy weight. Dr. Benjamin Spock in his book Baby and Child Care, advises that weight-loss programs for children should be based on changing the type of foods children eat rather than the portions. He encourages shifting the way a table looks. If your table is full of brown, dull colored and fried foods, look again. See how you can add bright colors to the table. Always have greens at every meal. The scientific evidence is clear. The closer a family comes to a plant based diet, the healthier and leaner they will be. This is not to say go hungry. Plant based diets are full of satisfying food like low-fat dairy products, beans, legumes, grains and hummus! This is especially easy in the kosher world. You don’t need a kosher cookbook to follow. Buy any vegetarian cookbook to find healthy ideas. In Asian countries, where obesity rates are lowest, the average portion of meat is a mere 1 ounce. Keep meat meals to a minimum. Fish, instead of meat or chicken, will save calories and fat while adding healthy omega 3s and other anti-oxidants. Color, color, color, is the key to a healthy table. Nutritious food is about what you put in, not just what you take out. Start thinking like a healthy eater. Pizza, a kid favorite doesn’t have to be fattening. Try this variation. *Speak with your rabbi as to how to properly clean grapes. Steps: 1. Preheat oven to 375. 2. Place grapes on a sheet pan lined with parchment paper. Sprinkle with olive oil, salt and pepper. 3. Roast for 15-20 minutes or until grapes start to burst. 4. Put grapes, goat cheese and thyme on pizza dough and put back in the oven for about 5-7 minutes. Enjoy. Shari Portnoy holds a Masters in public Health. She is a Registered Dietitian (RD), Certified Fitness Trainer (CFT), and a nutritionist. She has been a featured speaker at the American Culinary Federation National Convention, is a published author, a regular contributor to many websites, and is quoted frequently on AOLHealth and Glamor.com. Her first article in KASHRUS Magazine, “Shabbat Lite,” appeared in 2008.